When asked on the 200th anniversary of the French Revolution his thoughts about its impact the Chinese leader, Zhou Enlai, said: “It is too early to make a decision”. They play a long game in China. A long game in Montargis as well, where the ghosts of the Chinese Revolution are bringing a new generation of tourists to the town. At the exit to Montargis station, a good mile and something from the centre is a tiny monument in French and Chinese: Montargis, a town of canals, rivers, bridges and riverside cafés, is not just the “Venice of the Gelatins,” it is also plays a tiny part in the story of the Chinese revolution. In 1912 the Mayor of Montargis met with a Chinese businessman, Ll Shizeng. They discussed a project that became the “work-study movement”, (“diligent work and frugal study”) bringing Chinese students to the town to learn about western ideas. (Shizeng was a nutritionist; he studied at the Pasteur Institute where he worked on soybean products. In 1908 he financed and launched “Caséo-Sojaine” a soy-food manufacturing plant: all of the workers were Chinese, its location was Colombes. Shizeng was part of the elite of old China, but believed strongly in openness to other cultures). The project was launched, and soon many Chinese were making the long sea journey to Europe. In the 1920s there were over 300 Chinese in Montargis. 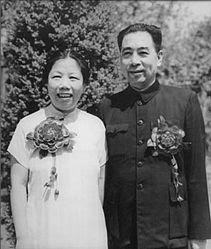 Zhou Enlai was in Paris, largely, but he came to Montargis often to recruit for what would become the Chinese Communist Party. Deng Xioping worked in the shoe manufacturing workshop – under the name Teng Hi Hien. In the Durzy gardens where now a “muscle gym” stands alongside the greenery, Cai Hesen and Xiang Jinya presented their ideas on “saving China and the World.” Some say this is the real starting point of the New China. “There’s not a museum yet, but it is significant,” they say at the tourist office. If the theory of travel (and tourist marketing) is that everywhere has “Someone” (Dover in Kent is already making claims on the 19 year old, Joss Stone), then Montargis is an interesting example of the shifts in “importance.” Around the town now, at the public baths, the main street, the park, the Durzy hotel now a museum, there is a trail for tourists and historians of China to follow. When Tom came he saw the old town, high on the hill. “At the towne Montargis ther is a very goodly Castle of the Duke of Guise strongly fortified, both by the nature of the place, and by art: it hath many faire turrets, and is situated in so eminent and conspicuous a part of the towne, that it might be seene a great way off in the countrey. Now the eleventh century church and outbuildings are part of a private catholic school complete with sweet bilingual teenagers who sit chain-smoking and taking in the post-class sun. In the 1930s Jean Cocteau escaped here from the chaos of Paris to write a play, Les Familles Terribles, a sort of Long Day’s Journey into Death and Drug Addiction with your average French bourgeois family. Jude Law made his Broadway debut in a revival in the mid-nineties. Hard as it is to imagine Coryat here, there is – high on the old ramparts – a sense of his seeing the countryside, his route, and following the course of the river south. How long to Lyon? You can hear him asking. It is far harder to imagine the Chinese revolutionaries doing business here, let alone at the same time as Cocteau was knocking off a play – in 48 hours as I remember. Everywhere has “someone”. Well, Montargis has discovered it has not just a “someone” but the catalyst for a “revolution.” Travel guides in Chinese are being written as we speak. This entry was posted in Montargis. Bookmark the permalink. “There’s not a museum yet, but it is significant.”Funny that a museum denotes significance. Makes me think of dustbowl towns in the American southwest creating a museum of rusted Pintos or somesuch to encourage tourism, and establish the town’s importance along the tourist trail. I’m there with you Olen. The cultural stance Robin reveals is also indicative of what France values enough to honor by preserving this memory. I think this humble honorific in Montargis is one of the best examples of globalization I can think of. Can you imagine a museum, let alone a plaque,commemorating a significant moment in the evolution of 20th century Communism anywhere in the USA?